The solar eclipse was way back in August but I’m just getting around to writing about it now. I believe I’ve already said enough about how good I am at procrastinating, so it seems unnecessary to enlarge on that any further. I got the idea I would like to see a total solar eclipse more than a year ago. It’s not an idea that just came to me out of the ether. I’m a geek for stuff like planets and outer space, so I follow the blog posts and Twitter tweets of scientists and fellow space nerds who talk about that kind of stuff 24/7, and they started talking about last summer’s eclipse many moons ago (heh). And because I follow all those guys, I knew I wouldn’t be able to see a total eclipse from my back yard or from any place near Wisconsin; I would have to drive many, many miles to see it, and I would probably have to figure out a way to talk My Darling B into going with me, because we have just one car and it would be rude to leave her without a way to get around for days and days. So when we got around to talking about where to go on vacation this summer, one of the suggestions I threw out was a road trip to St. Louis, Missouri, and from there to my mom’s in Bella Vista, Arkansas, and it just so happens that such a trip would coincidentally take us far enough south to see the total eclipse. Naturally enough, B wanted to know what there was to do in St. Louis that made me suggest it. She’s not dense, so I came clean right away and told her about the eclipse, but also that I’d always wanted to see the arch and that there must be other attractions in St. Louis that would make it worth visiting. We had plenty of time to find out what they were if we started planning ahead of time. And she agreed. What do you know about that? As our plans unfolded, we laid out a road trip south to St. Louis, then just a little bit further south to see the eclipse, then on to Bella Vista, Arkansas, to visit my mom for a few days, and finally to Memphis, Tennessee, to do we didn’t know what yet, but it was Memphis, so there must be something there to see, right? In St. Louis, we stayed at The Park Avenue Mansion B&B on Lafayette Square, an old brownstone mansion that had been lovingly restored by Kathy & Mike, the owners. If you like staying at a B&B instead of a hotel, as we do, I couldn’t recommend this place highly enough. Mike greeted us at the door with two giant poodle hybrids in tow; one was a labradoodle and I forget what the other was — something with “oodle” or “poo” in it. They waited ever so patiently while he introduced them, then came rushing forward to be petted after he released them. One of them had a ball — wait, I should have written it this way: HE HAD A BALL! HE DROPPED THE BALL! HE WANTED ME TO THROW THE BALL! I THREW THE BALL! “He can do that all day,” Mike warned me. It’s okay, we told him. We love to throw spit-soaked tennis balls. We could do it all day long, too. Mike knew every house on the square and told us all about them, but he didn’t mention Horace Bixby’s house a block to the north. Bixby was the crack river boat pilot who taught a young Samuel Clemens his trade. If the civil war hadn’t interrupted traffic along the Mississippi River, Clemens would probably have spent the rest of his days piloting paddle boats up and down the river and nobody would ever have read about Tom Sawyer or Huckleberry Finn. If you go to St. Louis you would have to visit the arch while you were there, right? And we planned to do that, but you have to get tickets if you want to ride the elevator to the top of the arch to look out the windows. We thought we’d do the smart thing and order tickets for the next day by going on-line. We were not as smart as we thought. Tickets for the next day were sold out. Seems you have to check the web site several days in advance. So instead of going up inside the arch, we drove into town just to get a close-up look at it the next morning. It wasn’t hard to find, and traffic was light so early in the day. We parked about a block from the old courthouse, which is now a tourist attraction administered by the National Park Service. That wasn’t part of our agenda; maybe next time we visit St. Louis. Then we strolled down to the park at the base of the arch so we could take a selfie with it in the background, because how do you go all the way to St. Louis and not get a photo of yourself in front of the arch? Over breakfast, we chatted with some of the other couples who were staying at the B&B. Every one of them was there because of the eclipse in one way or another. One couple was there because it was a long weekend for them; they worked for the state, and Missouri had shut down all state offices on Monday due to the eclipse. Not sure why. Another couple was there from Chicago because they up and decided on a whim, more or less, to get married where they could see the eclipse. A third couple was there just to see the eclipse. They all wanted to know what our plans were, and when we said we were there to see the eclipse, too, they cautioned us that thousands upon thousands of people were expected to come to Missouri for the eclipse and that if we didn’t get an early start, we would end up stuck in traffic. One of the couples was planning to head south before daybreak. That was never part of our plan. I told B that I would be perfectly happy seeing the eclipse in Lafayette Park, if we ended up stuck here, or along the side of the road, if we ended up stuck in traffic. I did not need to get up at the crack of dawn and hit the road right away just to see the damn eclipse. On the day of the eclipse, we drove to St. Claire, Missouri, a little burg about an hour’s drive south of St. Louis in normal traffic. Normal traffic, however, was the one thing we did not anticipate seeing that day, so we set out early. Got a little help from Kathy, whose directions got us out of the city with no trouble at all, and we arrived in St. Clair about a half-hour before the eclipse. My Darling B is the one who picked out the spot; she looked for places designated as official viewing places where there would be people in attendance who could answer questions about the eclipse, if anybody wanted to ask. We saw people camped out along the roadside and in several empty lots in and around St. Claire. We were looking for a saddle club, which turned out to be tucked away down a side road off the main road, almost hidden away. That may have been the reason there were so few people there. The way everyone was talking, I expected to be shoulder-to-shoulder with teeming crowds, but there were maybe fifty people, sixty tops, gathered on the grounds of the saddle club. The heat was incredible. I was dripping sweat just minutes after stepping out of our air-conditioned car. I’ll bet I sweated away a couple pounds of water just sitting motionless in a lawn chair under the shade of an umbrella waiting for the eclipse! Luckily we had several bottles of water, and I was guzzling them constantly. Probably the only thing that kept me from drying up and blowing away. The eclipse was not the life-changing event I heard many people on radio and television say it was for them, but no worries: it was every bit as cool as I hoped it would be. The sun was already being eclipsed by the moon when we pulled over and got out of the car; I glanced at it as we were getting our lawn chair out (though a protective filter!) and could see the moon had already taken a bite out of it. I believe we waited at least twenty minutes as the bite got bigger and bigger until only a sliver of the sun was left. From that point, things changed very quickly. There were a few clouds in the sky, especially off to the west, so I was hoping we might see the shadow of the moon as it approached, but it came too fast for that. Just before the last sliver of the sun disappeared, an odd, silvery light fell over the grounds of the saddle club, and when the sun was entirely eclipsed, it was as if someone had quickly run a dimmer switch almost all the way off. A collective “WHOA!” and a little nervous laughter rose involuntarily from the people gathered around us as we were plunged into twilight. 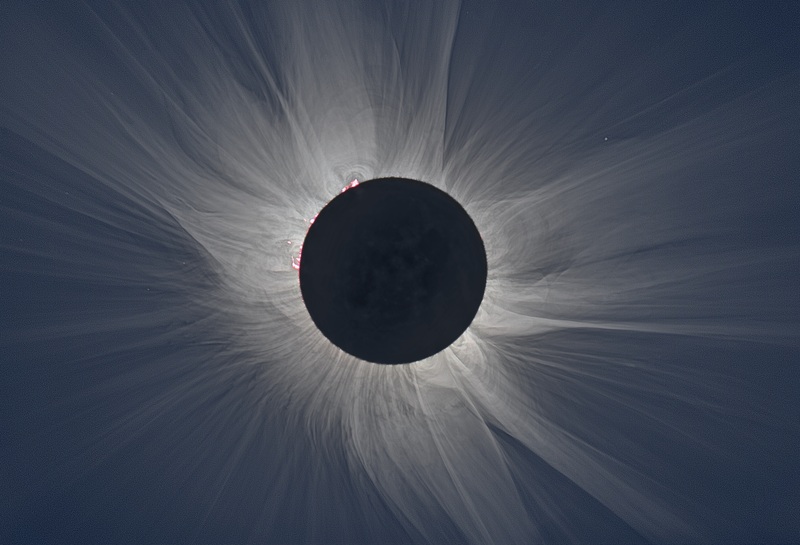 We could look directly at the sun’s corona while the moon eclipsed the disk of the sun. It streamed out in all directions, the way long hair does when it’s suspended in clear water. I’ve seen a lot of photos of it, but the one that looked most like the eclipse I saw is one from NASA. Of course it is. The eclipse lasted about a minute and a half. We didn’t need a warning when the sun began to peek out over the edge of the moon again; the blaze of light was unmistakable, and everybody put their filters over their eyes again. I’d rather this story had a happy ending, so the part where we were stuck in traffic for 9 hours afterwards is going to be a story for another day.